According to the general consensus of technology experts (read: Google search results), making the change from a spinning-platter mechanical hard disk drive (or “HDD”) to a solid state drive (or “SSD”) is one of the most beneficial and noticeable upgrades you can make to a computer. 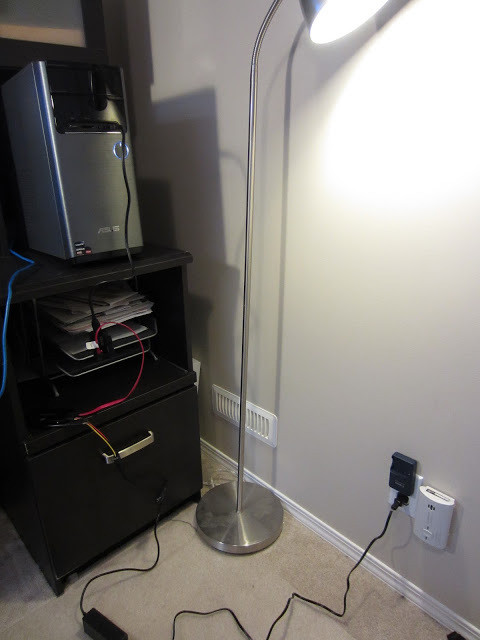 I’ve been using a Mid-2013 MacBook Air for the past couple years as my personal computer, and recently purchased an Asus M32BF desktop tower computer (CA-005T configuration). We were finding that having a computer at home would be required, now that the laptop would need to be taken out of the house for work while somebody was still at home. I had been considering a desktop PC for a while, and you get so much more bang for your buck with a tower-style computer than you do with a laptop PC. Not only that, but they are much more upgradeable than a laptop. Had I not already been used to the MacBook, I probably wouldn’t have thought anything of those two details (it’s strange, the way a person is okay with things when they don’t know any better). I quickly realized that these annoyances were being caused by the fact that the operating system was being run off of an HDD (like the vast majority of computers) instead of an SSD (like computers SHOULD be). 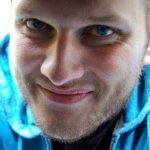 Aside from the cost-per-byte aspect, SSD’s are far superior to HDD’s in just about every other way, and there’s really no excuse for computers to come with anything other than an SSD as its main (or only) storage drive. HDD storage is so inexpensive (either internal SATA drives or external USB drives), it’s incredibly easy to supplement a lower-storage, higher-performing SSD with a higher-capacity HDD to handle the data storage for media backup of photos and music. The reason I say “backup” is that there are so many cloud storage options (many of them free to host your photos and music, or very affordably priced to host any type of data/files) that there isn’t really any reason to need to keep local copies around to actually access and use the media. For a more feature-based experience, services like Plex offer a media server interface to stream your content to your internet-connected devices. Because of this, users are now able to get away with a 128 gigabyte local SSD that hosts the OS and applications, supplemented by a larger-capacity HDD (external or otherwise) to be used as a backup and/or data & file storage drive. After doing a bit of research into what to look for when purchasing an SSD, I settled on the Samsung SSD 850 EVO, in the 250 gigabyte capacity variety (on sale for $100 from Best Buy). 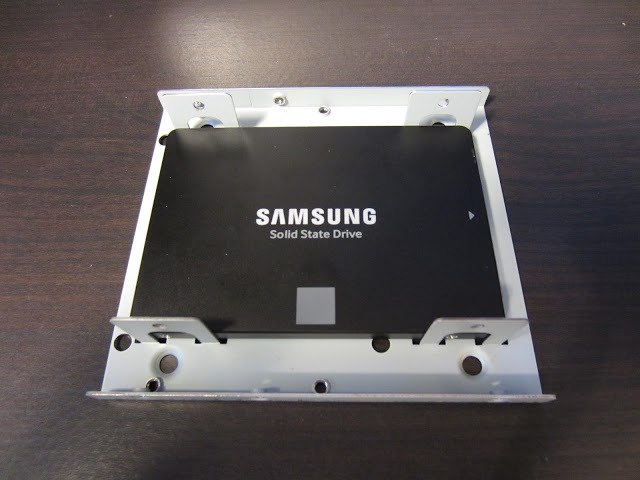 Having an SSD this size offers sufficient capacity to contain the operating system files (the “minimum” capacity), with a healthy amount left over for applications and primary file storage. Any additional data storage will be taken care of by the original two terabyte HDD that came with the computer. It never fails to surprise me when I find a windowed-enveloped compact disk packaged with a piece of hardware or a peripheral (you can find literally any piece of manufacturer software and driver directly on the manufacturer’s web page, if not a mirror/hosting of it on a non-sketchy site – details forthcoming). 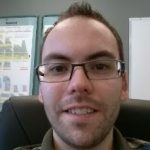 In any case, the user manual of the SSD instructed me to load the CD into my computer and install the two pieces of software intended to be used with the drive – Samsung Magician (the drive management software) and Data Migration (fairly self-explanatory here). Downloads for these are, as alluded to, available on the Samsung website. The reason I know this is because I had to look up an issue I was having with the Samsung Magician software and recognizing my operating system as Windows 10 – downloading and installing the latest version of the software from the website fixed this issue. Strangely enough, the software even has a built-in “Check for Updates” feature that didn’t notify me that the software was out-of-date. That being said, I’m not surprised it was out of date, because it’s 2015 and software updates occur every other week (which physical media tends to be poorly adapted for handling). The second step after installing the software is to connect the SSD to the computer for preparation and/or data migration. 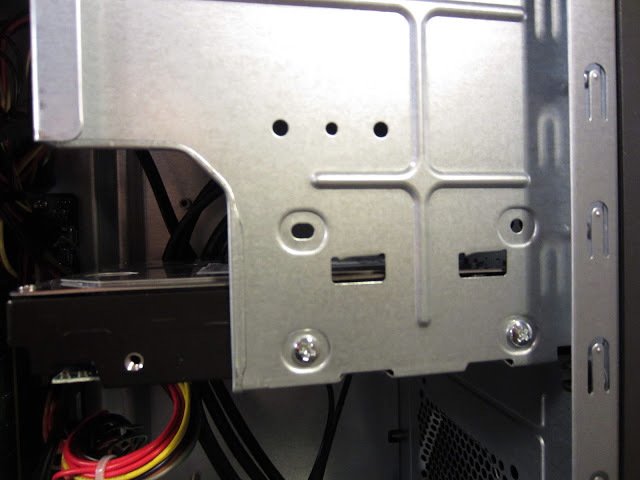 The user manual suggests connecting the drive to the computer via USB (using the aforementioned SATA-to-USB adapter), however my research indicated there was a way of accomplishing the same setup/migration through the SATA connectors inside the computer. Despite this, I opted for the USB setup because I felt that the adapter was actually a useful thing to have anyway, and the USB setup seemed to be more straightforward and I didn’t feel like any more hassle than I was already faced with. 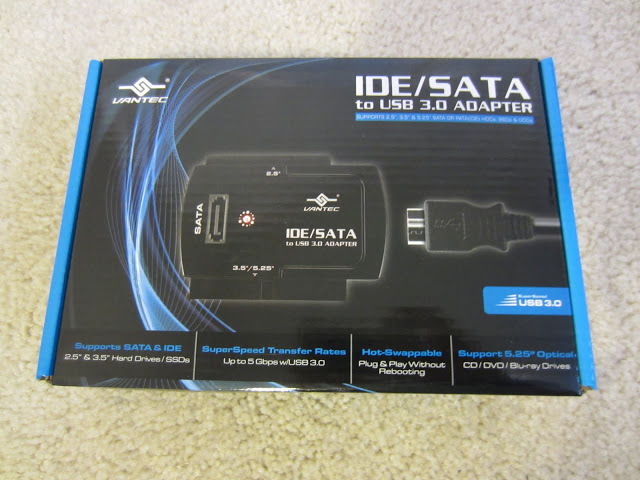 I picked up the Vantec IDE/SATA to USB 3.0 Adapter for $35 from Memory Express. This adapter supports not only SSD/HDD hard drives, but 5.25″ optical drives as well (CD/DVD/Blu-ray). 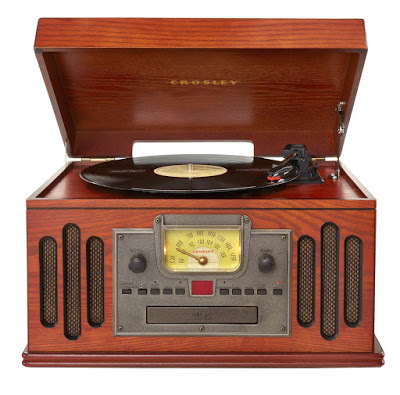 This made the $35 worth it for me to invest, as it allows me to turn any of these devices into a plug-and-play external device (for either data retrieval/recovery, or using a Blu-ray drive with a PC media setup). 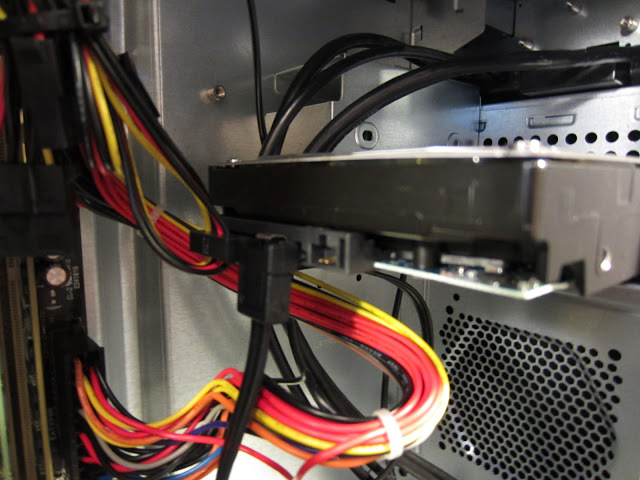 After connecting the SSD to the PC using the SATA-to-USB adapter system, the PC recognized the SSD with no issue as an available storage device. This allowed me to run the Magician software to do the initial checks/setup on the disk. Functionality-wise, the Magician software essentially serves as a diagnostic check and optimization tool for Samsung SSDs. 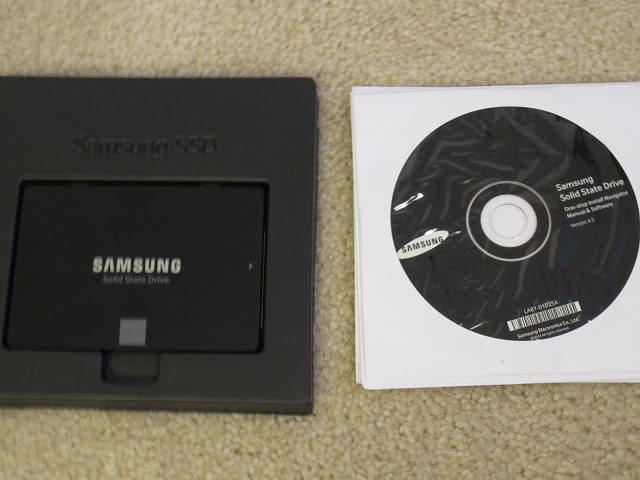 While the disk is empty, it doesn’t serve much purpose other than to let you know that the drive you just purchase isn’t dead out of the box and is a genuine Samsung product. The Magician software verified my purchased SSD as a genuine Samsung product (as expected). 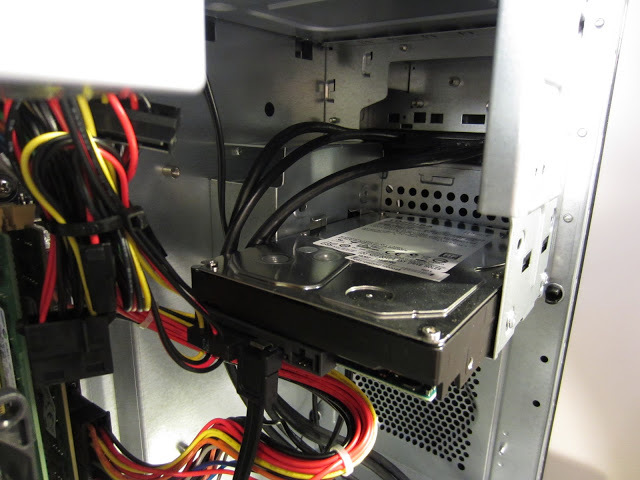 The software then checked for any firmware updates for the SSD (there was one), and any optimization had to be done once it was mounted as a system hard drive.The next step was to connect the SSD directly to the PC using the SATA ports on the drive and the motherboard of the computer. 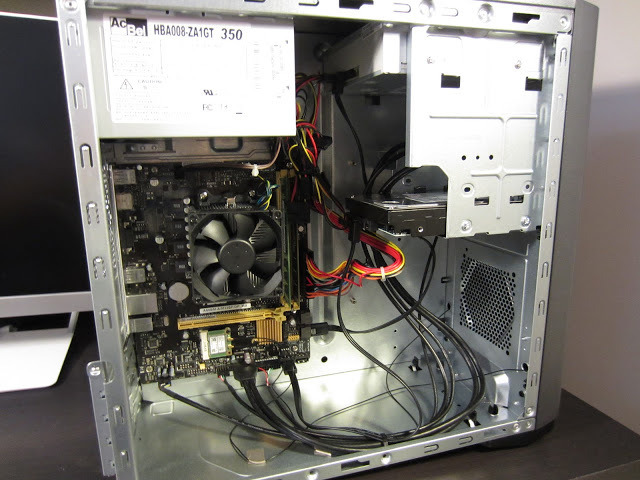 In order to access the motherboard of the computer to install the SSD, I of course had to open up the computer case.At this point, power down the computer and disconnect the computer’s power supply from the wall plug. As I hadn’t opened up a tower computer before, I was worried about removing all the various screws I could see when I turned the computer around. 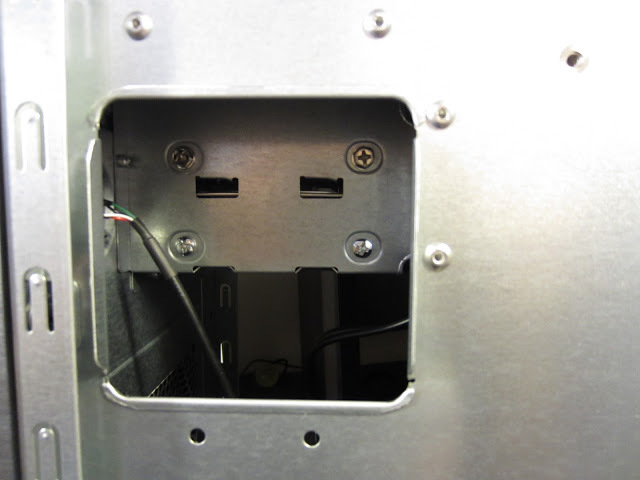 Thankfully, I first removed just the screws that were in the grey case (see empty screw holes in the above pictures), and that was all that was required to be removed in order for the sides of the case to slide off. After examining the side that allowed access to the internals, I could see where the factory HDD was located and how it was connected to the motherboard. 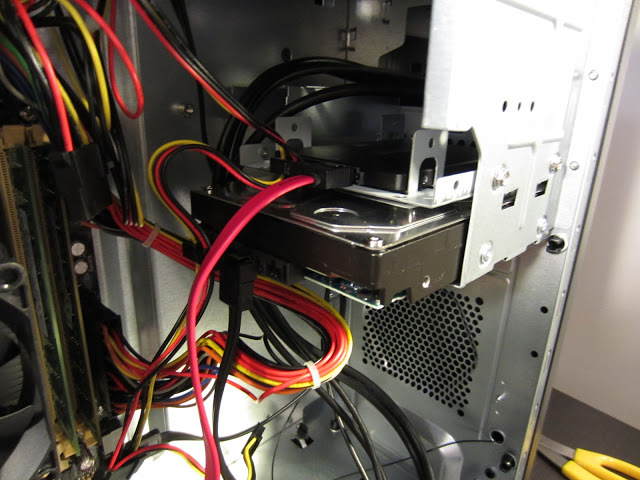 Above the existing HDD was some room with additional mounting holes in the sides – this is where additional drives (such as my SSD) could be installed. 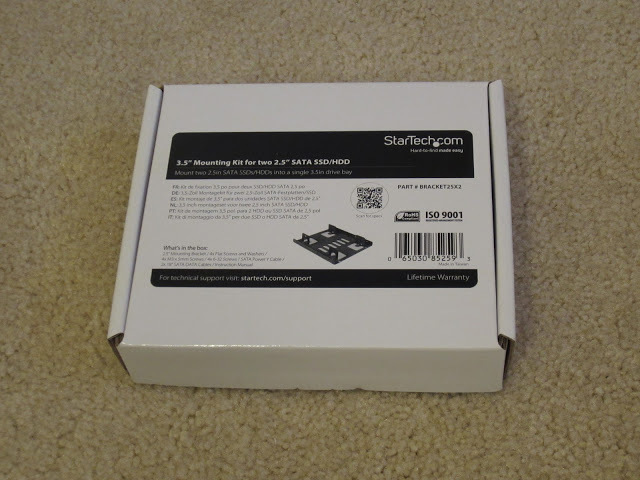 Now that I confirmed there was a place to install the mounting hardware, I attached my SDD to the StarTech 3.5″ Mounting Kit I purchased from Memory Express for $15. 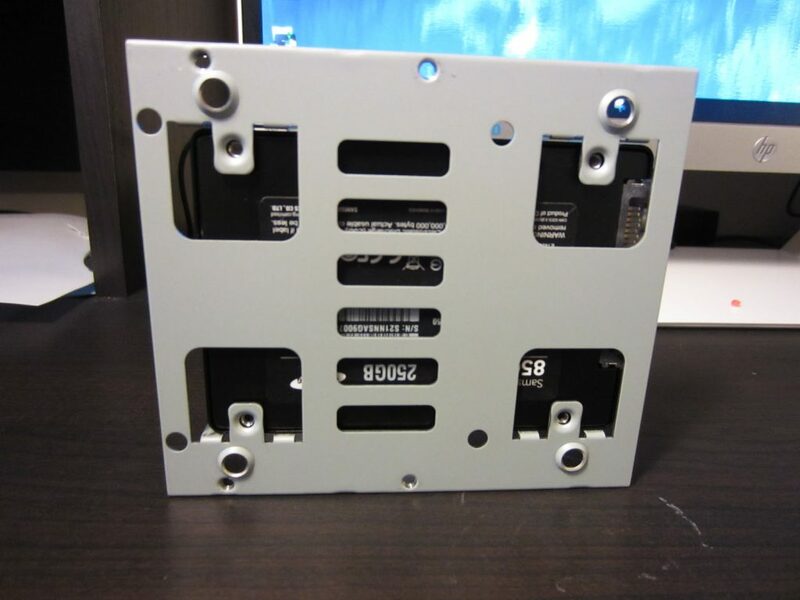 This kit included the frame, screws for securing the SSD to the frame as well as the frame to the PC, as well as a power supply and SATA2 cable. 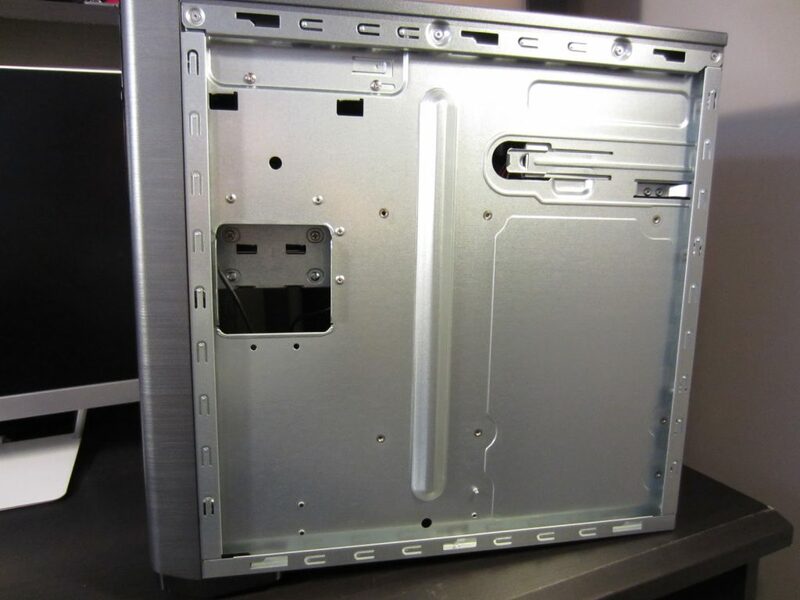 Once the SSD has been screwed into the frame, it is ready to be installed in the PC (make sure you orient the SSD correctly in the frame, as the frame’s side screw holes need to align properly with the PC bay. If you don’t check this beforehand, you’ll have to unscrew the SSD and turn it around to have the port end pointing in the proper direction… not that I would know from experience or anything). 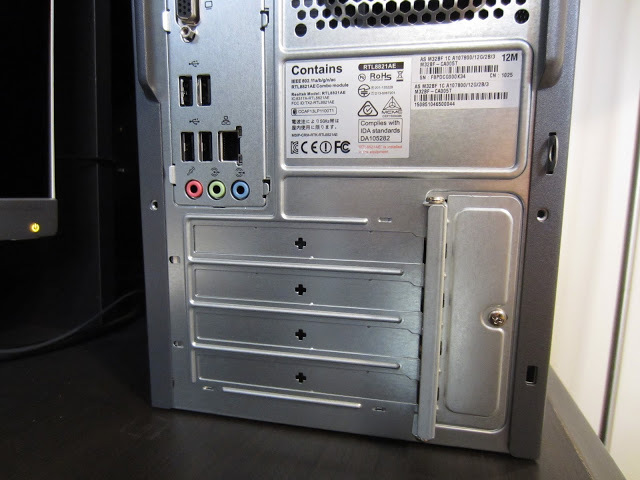 After screwing in one side of the bay, you’ll have to turn the PC around and access the other two screw holes, potentially through a little window like mine has. 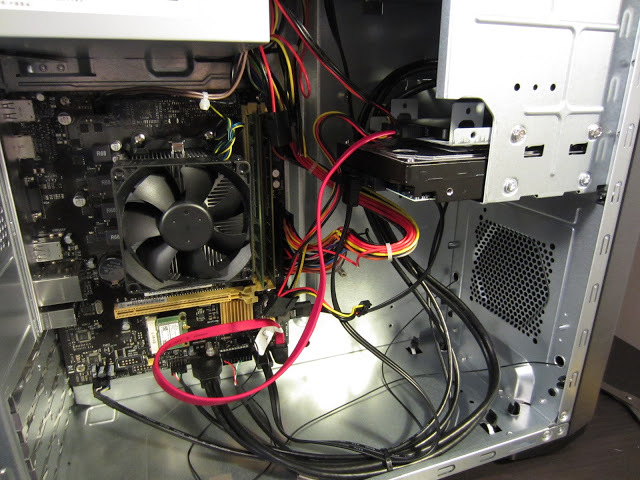 Once the frame has been installed inside the PC hardware bay, we are ready to connect the device to the motherboard using the SATA3 cable, and to the power supply. 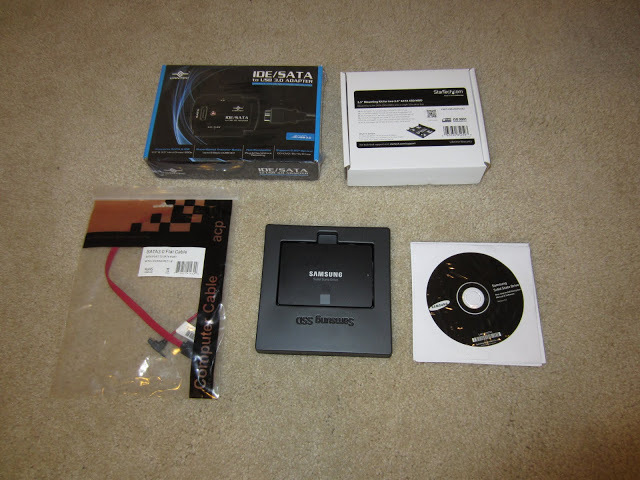 I had purchased a SATA3 cable (even though a SATA cable was included in the mounting kit, it was just a SATA2), and there was an unused power supply connector in the PC that could be used with the SSD. All I did was unplug the connector that was in the HDD and use it for the SSD, then use the connector below that one for the HDD (since the SSD was installed above the HDD in the bay). I then connected the SSD to one of the spare SATA ports on the motherboard (it doesn’t matter which one is used, as long as it’s a SATA3 port if there’s one available). Now that the SSD is connected to both the power supply and the motherboard, we are ready to boot the computer up and get into some disk management. The last step in the SSD upgrade is preparing the disk to be used with your computer system. There are two options – you can use the SSD as a secondary data storage/applications drive, or you can use it as the primary disk that the operating system boots from and runs off of for tasks and applications (while using additional available capacity for data storage, if you so choose). If you’re simply going to use the SSD as additional storage, all you need to do is format the disk (Windows has a wizard for this, and if you can’t find it then Cortana should be able to help you out). Once the memory on the disk has been converted from unallocated to free space, you’re on your way. If you go that route, however, you won’t reap the benefits of a speedier system (booting, file structure navigation, application loading, etc. ), as your main OS function will be based on the HDD. To use the SSD as your primary boot drive that the OS runs on, you’ll have to install a copy of your operating system on that drive. This requires preparing a recovery disk/USB drive (I recommend the USB drive, for speed and convenience). Again, Windows has a built-in wizard for this, or there is a Microsoft site that you can download the Windows 10 media creation software wizard. For other operating system versions (Windows or otherwise), the process is the same – make sure you have the OS install media created before moving on.Once this media (either a DVD or a USB drive) has been created, you are ready to use it to install Windows on your new SSD. 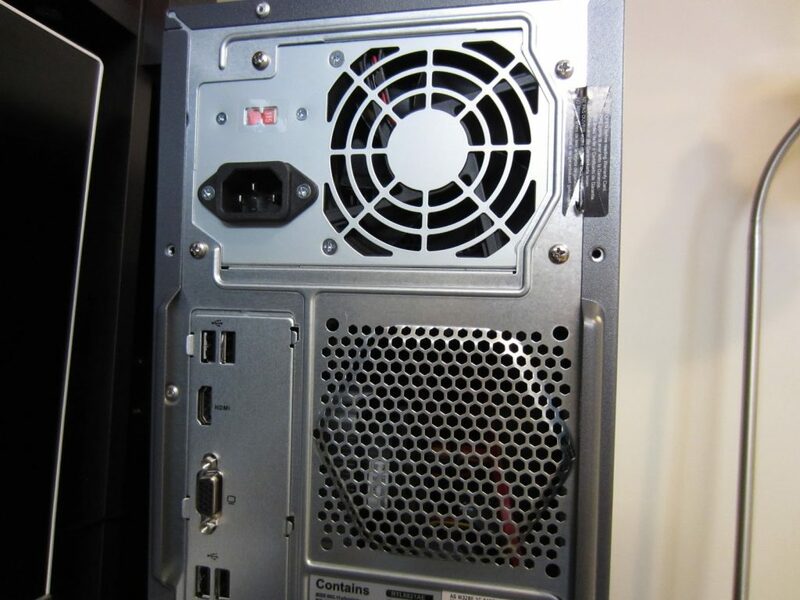 First, insert the install media into the computer (either insert the DVD into the drive, or the USB drive into a USB 3.0 port), then restart your computer. Once it boots back up and you see something on the screen, at the bottom of the screen will say “Press < > to enter BIOS” or something to that effect, where < > is a specific key. For my computer, it was <F2>, and it is commonly the same on other systems. Once you enter the BIOS, you will have the ability to change the boot order of your system devices. In the available devices screen should be your existing hard drive(s), your new SSD, your optical drive (if there is a disc inserted into it), and your USB drive (if there is a drive inserted into it). These devices may have names displayed that aren’t familiar, however there will usually be an indication of which device it is referring to (either based on manufacturer referenced, or connection type). Once the install media device is located, move it to the #1 boot priority (before either of the hard drives). 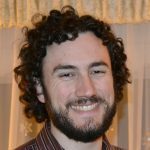 Save and close these changes, and allow your computer to complete booting. After the computer completes booting, it will take you to the UI of the boot media installation process. For the Windows 10 installation, you are asked to choose which storage volume you would like the operating system installed on; you will see your existing primary HDD partitions (most likely numbered as volume 0), your existing additional HDD volumes (numbered as 1, 2, etc. ), and then the highest volume number is most likely your SSD (with some identifying info attached to the volume, such as manufacturer and/or model details). The volume size should also match what you would expect (e.g. ~250GB for a 250GB SSD). This volume will not yet have any partitions. Once the appropriate drive is selected for the installation, the Windows 10 installation wizard goes through its process and completes the installation. After another restart of the system and modifying the BIOS to boot from the SSD drive first (before any other device), you should be able to successfully run Windows from your brand new SSD! The previous primary HDD can now be used as either a backup/secondary boot drive, or be wiped clean and reformatted to be used as data storage. At first I tried migrating my OS to the new SSD using the Samsung Data Migration application. This utterly failed – I was able to boot into Windows, but the desktop wouldn’t load after logging in. If this happens to you and you want to start over, make sure you WIPE the data off of the disk before doing a fresh install. Do not FORMAT the disk. Formatting the disk leaves the migrated Windows partitions on the SSD (a memory and recovery partition). When the installation wizard attempts to install the OS on the new drive, it sees more than one partition for the volume and gives an error. The only way to fix this is to wipe the disk and re-initiate the installation process. Continue OS installation as described above in Part 3. After about a month of using my new SSD (31 days to be exact), the disk decided to “lock” itself. I spent a couple hours calling around to Asus, Samsung, and Best Buy, it was made clear to me that the only solution was to get a new SSD and start over. I called Asus first because I encountered the issue after restarting my computer after updating some software and being prompted to reboot. The computer booted directly into the BIOS and asked me choose which device I wanted to boot off of. The SSD that the OS was installed on wasn’t even available as a device to select, however it was shown in the BIOS as being connected to the SATA port. This seemed like a BIOS issue. Asus took me through some BIOS troubleshooting (read: had me reset the settings to “Optimized”, “Default”, and the had me boot into a “hidden” recovery portion by holding <F9> at the boot screen instead of <F2>). After this proved to be futile, they gave me instructions to send the computer in to their service department for them to look at, and to remove any hardware that didn’t come with the computer as they couldn’t guarantee it would come back (okay). I knew they were just going to reinstall windows on the original HDD and send it back if I did that, so I did a bit more digging. I remembered I had my Windows 10 recovery USB, so I plugged that in and restarted my computer. Progress! The bootloader UI started up and I picked the troubleshooting option. This is when I discovered what the issue was – the bootloader gave an error that the boot drive it was trying to access was inaccessible because it was locked. After doing some searching on “locked Samsung Evo 850 SSD”, it seemed to be a non-unique issue. This is when I contacted Samsung – their response was essentially “Oh I’m sorry to hear that, just send it back to us and we can send you a new one”. I asked *why* it was locked (as it was working perfectly fine an hour earlier before I restarted the computer and hadn’t done anything to it other than update my video card software/drivers). They didn’t have an answer for me, and said that they were happy to replace it (provided that I paid for the shipping and put a deposit on a new SSD until they received the old one so that they could send the new one right away). It was at this point that I checked my Best Buy receipt and noticed that I was at 31 days past the date of purchase (they have a 30 day return policy, and I hadn’t purchased the in-store extended warranty to cover me for manufacturer’s defects and repairs). I took my chances and headed over to Best Buy, receipt and repackaged SSD in hand, to ask for an exchange for a new Samsung 850 Evo SSD. Sure enough, the representative at the returns desk took it back with essentially no questions asked after I said it had stopped working, and I even pointed out it was a day past the 30 day period (to which she replied “Ahhh, don’t worry about it”). Installation to this second SSD went a lot more smoothly than the first one, thanks to these prior learnings/experiences. It has been working perfectly without issue since. After all was said and done, this was a relatively easy process for someone who is confident enough to open up their computer to perform themselves. Of course, your friendly neighbourhood computer/electronics store would happily do the upgrade and installation for you, but I think it’s a lot more satisfying to do this kind of thing yourself and have that sense of interest and pride in your electronics and technology.